, a chronic skin condition that causes inflammation and itchy, sometimes painful flare-ups, affects an estimated 35 million Americans. It is a life-long condition that often starts within the first year of life. In fact, about 80% of all cases are present by age 5. While no one truly knows what causes it, certain risk factors have been identified, such family history and ethnicity. Published in the British Journal of Dermatology, a new study has now found yet another possible risk factor: the use of antibiotics during infancy. For their study, researchers from Guy’s and St. Thomas’ NHS Foundation Trust, King’s college London, the Aberdeen Royal Infirmary and the University of Nottingham in the UK analyzed the data from 20 different research studies involving children and young adults, aged birth to 25. Overuse of antibiotics has been linked to a number of issues, including more difficulty fighting common infections. Because of this, pediatricians have been working at scaling back the number of antibiotics given to young children. 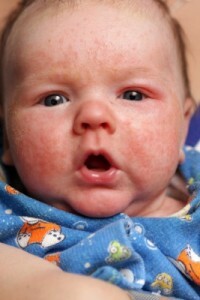 In addition, eczema is the most common form of disease in children. Researchers on the study were curious if there was any link between the use of antibiotics and the development of eczema. To find out, the authors looked specifically at how the exposure to antibiotics both before birth, and up to one year after, impacted the development of eczema later in life. According to the results, children who were given antibiotics as infants were more 40% more likely to develop eczema. Each additional course of antibiotic use was found to further increase the risk by an additional 7%. However, interestingly enough, the use of antibiotics prenatally did not have any notable impact on the development of the disease. The authors aren’t exactly sure why the link exists. However, they believe it may have something to do with the alteration of gut flora. Several studies have suggested that the alteration of gut flora during the first year of life may be responsible for a number of immune and autoimmune conditions. Additionally, a study published in the journal BMC Microbiology revealed that the types of bacteria found in the guts of eczema sufferers was different than the flora found in those without the condition. “One potential explanation is that broad-spectrum antibiotics alter the gut microflora, and that this, in turn, affects the maturing immune system in a way that promotes allergic disease development,” one study author, Dr. Teresa Tsakok of guy’s and St. Thomas’ told Medical News Today. Nina Goad of the British Association of Dermatologists, who was not involved in the study, says that eczema is the UK’s most common skin disease, affecting 1 in 5 children. She also says that the condition has shown an increase over the past several years, particularly among children in high-income countries. The reasons for this are understood, but the data from this study seems to make sense. So, while she states that the data from this study is not fully conclusive, parents should heed this as a message: antibiotics should not be requested by parents, and they should only be given when suggested by a physician. “The evidence is not conclusive and the researchers are not suggesting that parents should withhold antibiotics from children when doctors feel such treatment is necessary, but studies like this give an insight into possible avoidable causes and may help to guide medical practices,” Goad told Medical News Today.